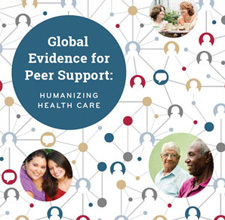 Peer support (PS) is a strategy for improving quality of care for people with chronic disease and is increasingly being integrated with primary care. We conducted semistructured qualitative interviews with 18 staff members from 4 practices that have integrated PS and primary care. From these interviews, we identified several benefits of PS and primary care integration as well as challenges to integrating and sustaining PS programs. We also identified key considerations and strategies for facilitating integration. Strategies for developing messaging to promote understanding of the unique role of peer supporters are discussed.